COLUMBUS, Ohio (Feb. 26, 2015) – The 4R Nutrient Stewardship Certification Program has announced Luckey Farmers, Inc.’s Berkey Farm Center in northwest Ohio has been added to its growing list of nutrient service providers to achieve certified status. The voluntary certification program is a concentrated effort by the agriculture industry to significantly reduce and prevent applied nutrients from running off fields, which has contributed to harmful algal blooms in Lake Erie, such as the one responsible for the shutdown of Toledo’s water supply in early August 2014. The Berkey Farm Center has been in operation under Luckey Farmers, Inc. since 1997, and Willie Gombash, branch manager, has been working at the facility for more than 40 years. 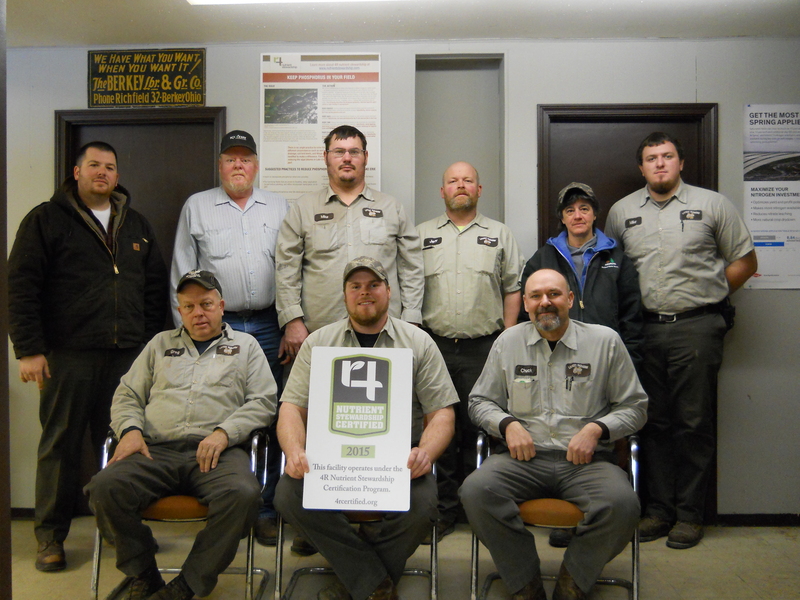 The location currently has nine employees that work diligently to promote the 4R’s. Luckey Farmers, Inc.’s general office is located in Woodvile, Ohio, with 10 branch locations throughout northwest Ohio. The 4R Nutrient Stewardship Certification Program certifies that individuals and entities in the Western Lake Erie Basin that sell, apply or make recommendations on how fertilizers should be applied to crops are doing so in accordance with 4R Nutrient Stewardship principles – which refers to using the Right Source of Nutrients at the Right Rate and Right Time in the Right Place. Applicants must go through an audit and demonstrate they not only understand 4R principles, but also follow them. Approximately 65 facilities servicing more than 1 million acres in the Lake Erie Watershed in Indiana, Michigan and Ohio have begun to go through the certification program. “We are proud of the work Luckey Farmers, Inc.’s Berkey Farm Center is currently doing and its commitment to following the requirements of the 4R Nutrient Stewardship Certification Program,” said Andrew Allman, executive director of the Nutrient Stewardship Council. “By participating in this program, this branch has proven its dedication to the long-term improvement of Lake Erie’s water quality, and we recognize their facility as a 4R Nutrient Stewardship Certified location,” said Carrie-Vollmer Sanders, Nutrient Stewardship Council chairwoman. Currently, four nutrient service provider locations covering approximately 250,000 acres in Ohio are 4R Nutrient Stewardship Certified. The 4R Nutrient Stewardship Certification Program is governed and guided by the Nutrient Stewardship Council, a diverse set of stakeholders from business, government, university and non-governmental sectors with a common goal of maintaining agricultural productivity while also improving the quality of Lake Erie and its contributing watersheds. The program is administered by the Ohio AgriBusiness Association. For more information, visit 4Rcertified.org, email aallman@oaba.net or call 614-326-7520 ext. 1. MEDIA: Download the high-resolution photo of Luckey Farmers, Inc.’s Berkley Farm Center receiving its 4R Nutrient Stewardship Certified sign. PHOTO CUTLINE: Employees at Luckey Farmers, Inc.’s Berkey Farm Center hold a sign commemorating their achievement of being named 4R Nutrient Stewardship Certified.